Q. 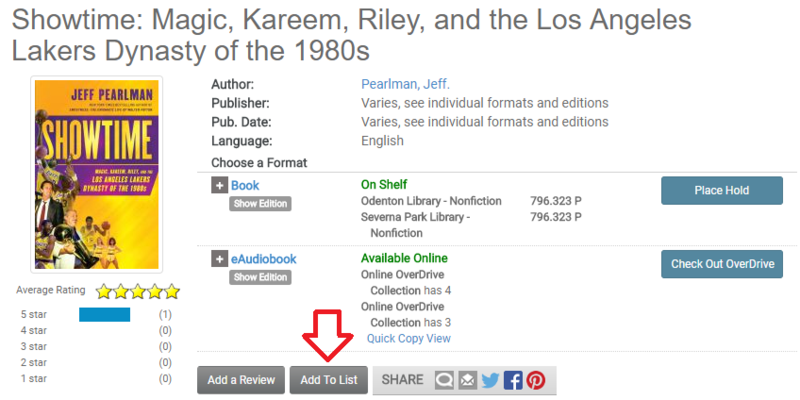 How can I create and share booklists in the library catalog? Name your list and, if you would like, provide a brief description of it. Please note the “Access” setting. It defaults to “Private,” meaning you are the only person that can see your list. If you would like to share your list with friends, click the word “Private,” which will change it “Public.” Click “Create List” to finish. When you want to add a book to your list, simply search for it in the catalog. Once you find the record, click the “Add to List” button. From the drop-down menu, choose the list you want to add the book to. You can also click the “Create a New List” button to the right of the menu if you want to add this book to a brand new list. Click “Save to List” to add the book. You can access all of your lists by going to “My Lists” under “My Account.” Along the top of the list, you will see options to email your list to other people, print the list, sort the list, generate citations as well as add multiple titles at once using ISBN numbers. You will also see the option to make your list public or private. You may edit or delete your list at any time.